The guesthouse offers a coffee shop/café. Wireless Internet access is complimentary. 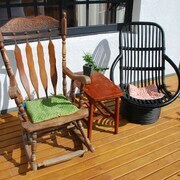 This Tainan guesthouse also offers a terrace, a garden, and coffee/tea in a common area. Limited complimentary onsite parking is available on a first-come, first-served basis. IsShoNi House is a smoke-free property. 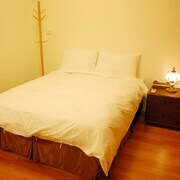 Located in Tainan City Centre, this guesthouse is within a 5-minute walk of Anping Canal and Shennong Street. Chihkan Tower and Tainan Confucian Temple are also within 1 mi (2 km). Tainan Station is 28 minutes by foot. Along with a coffee shop/café, this smoke-free guesthouse has coffee/tea in a common area and a refrigerator in a common area. Free WiFi in public areas and free self parking are also provided. Additionally, free use of bicycles, express check-in, and express check-out are onsite. All 5 individually furnished rooms feature free WiFi and room service. For a bit of entertainment, guests will find LCD TVs with cable channels, and other amenities include refrigerators and down comforters. Housekeeping is available once per stay. IsShoNi House offers 5 air-conditioned accommodations with complimentary bottled water and slippers. Each accommodation is individually furnished. Beds feature down comforters. LCD televisions come with cable channels. Bathrooms include complimentary toiletries and hair dryers. Guests can surf the web using the complimentary wireless Internet access. Housekeeping is provided once per stay. Cooked-to-order breakfasts are available for a surcharge and are served each morning between 9 AM and 1 PM. IsShoNi Cafe - Overlooking the garden, this restaurant specializes in international cuisine and serves breakfast, brunch, lunch, and light fare. Open select days. Recreational amenities at the guesthouse include complimentary bicycles.